CALGARY -- Suncor Energy Inc. (SU.TO) says it expects to meet its 2017 production targets despite a fire that shut down Syncrude's Mildred Lake oilsands upgrader nearly two weeks ago. Suncor's 2017 guidance, issued Nov. 17, estimated it will produce the equivalent of between 680,000 and 720,000 barrels of oil per day, including between 150,000 and 165,000 from Syncrude. The fire, which injured one employee, erupted March 14 and burned for two days. 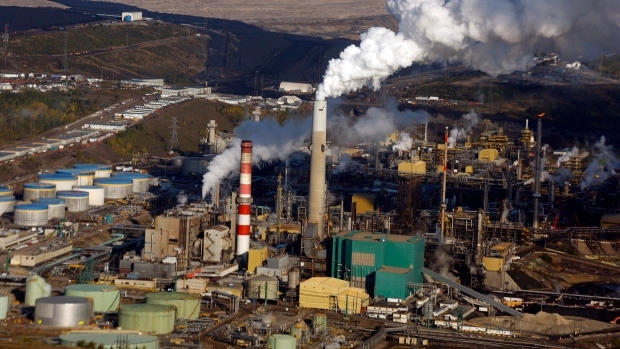 While much of Syncrude's workforce returned a day after the fire, Imperial Oil (IMO.TO) said in a separate statement Monday that there are no shipments of synthetic crude from the operation at this time. Suncor says some of the impact of the unplanned outage will be offset by advancing an eight-week turnaround that was originally scheduled to begin next month. The company also says it will handle some of Syncrude's untreated production, starting this week, and it expects to begin moving treated product by pipeline starting in April. Suncor owns about 53.7 per cent of Syncrude and Imperial Oil owns 25 per cent.